About the Book: After a string of hurricanes destroys the Gulf Coast and a sickness known as Delta Fever breaks out, a wall is built and the Gulf is quarantined. Separated by blood types tribes form in Orleans and Fen is living with the O-Positives when a fight starts to break out. Fen is left with the baby of her tribe leader and she begins to run in hopes of getting the baby over the wall before her blood becomes tainted with the fever. Fen meets Daniel, who is trying to find a cure for the fever, and together they must help each other survive. 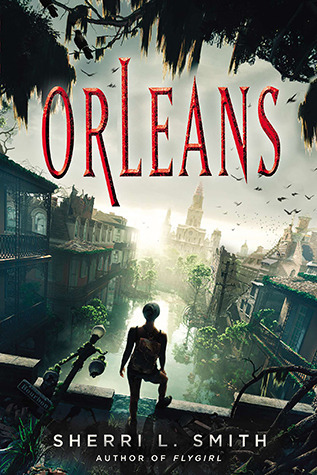 GreenBeanTeenQueen Says: Orleans is a dystopian that has a unique premise. It's set in a future where part of the US has been cut off and people have been broken up into blood type. That premise alone makes the book stand out in the crowded field of dystopian lit. Even though it has dystopian elements, I would call Orleans more of a survival story than anything else. The story is about Fen and Daniel and their quest to survive in a dangerous world and society. The novel is told in two points of view-Fen's first person and Daniel's third person. Fen's voice is great and she has a bit of a dialect that makes her character memorable and real. The story is brutal and haunting and the memory of Fen getting scars on her arms is one that will stick with readers long after they finish. Perfect for readers who like books about survival with a touch of the future. Sounds like a good story. I've been seeing it around everywhere lately. Thanks for the review. I received a copy of this for review but it hadn't really been on my radar. I think it might be a little too intense for me as I don't usually like survival stories but I'm still interested in giving it a try.